Want to know something absolutely corny? I'm sure you probably don't, but I'm going to tell you anyway. I was taken to the James Squire Brewhouse by my boyfriend on our first date. I'm quite sure that that fact induced at least one 'awwww' out there. I'm also quite sure that a trip to said Brewhouse will induce at least one 'ohhhh' of delight. 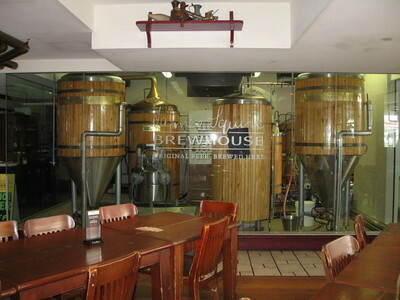 The brewhouse is a hybrid venue; a mixing pot of all things delicious. Think traditional pub food, easy drinking beer at the bar and a unique old timey atmosphere. Located in the heart of the city, the micro-brewery is a refreshingly honest place where there are no gimmicks, just quality service. I'm not going to lie; I'm not much of a beer fan. In fact, mostly I hate it. But, I thought in the spirit of first date presentation, and trying not to look to fussy in front of my new boyfriend, I apprehensively bought a pint of the golden ale. To my surprise, I actually enjoyed the beer, which is a testament to quality beverages served at the brewhouse. We took a seat at one of the many large wooden tables and revelled in the homey ambiance. The décor of the brewhouse has a definite theme; that being rustic varnished wood, which covers the entirety of the bar and seating areas. As we drank our beers, we started to make awkward first date conversation about the imposing mirco brewer that is located in the corner of the venue (also made out of wood). We learnt, on talking to one of the waitresses, that they do guided sessions into the brewery and show how the beer comes from the grain mill to the tap. The table next to us, a group of suits enjoying a beer after work, was destroying the brewhouse's signature beer tasting paddle; a wooden paddle containing 6 of the venues famous ales. The rest of the crowd is mostly in the late 20's to 30's age bracket, but any beer lover is more than welcome. We found the prices fairly high, but like a true gentleman, my boyfriend paid the cheque (which should be practice for any first date, just in case any of you men out there were wondering). In regards to the food, the prices for mains ranged from $15-$35, the steaks being the most expensive thing on the menu. The beer prices were reasonable for a CBD venue, ranging from $4.50 for a pot, $7 for a schooner and 8.5 for a pint. James Squire Brewhouse is open 7 days for lunch and dinner. If you're planning a trip there, don't get caught without a booking. On a Friday and Saturday night there is barely enough room to stand, so you'll need to make a reservation in order to get a seat. So if you have a first date coming up, or just have a hankering for a great beer, why not give the James Squire Brewhouse a try. You just might get lucky! Why? A refreshing beer after a hard day at the salt mines.